I was happy to find this volume of Dr. Cramp’s 1868 work on Baptist History. Cramp was born in England (1796) but spent almost all of his ministry in Nova Scotia, Canada. Originally published by Elliot Stock, Paternoster Row, London, this volume is a 1987 reprint by Baptist Heritage Publications of Watertown, Wisconsin. It contains the original Introductory Notice by Joseph Angus of Regent’s Park College, London, and also a review of the book done by C.H. Spurgeon in a 1868 edition of The Sword and the Trowel. In almost every book on Baptist History one will find a reference to J.M. Cramp. This is the first time I had an opportunity to read the book for myself, and I was not disappointed. It reads like a cross between Foxe’s Book of Martyrs (which Cramp references and also gives some little known history of Foxe himself) and Anabaptist/Baptist history. 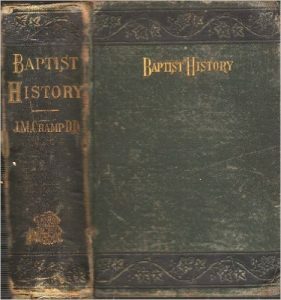 The editor of the current edition, Dr. Richard Weeks, professor of Baptist History, Maranatha Baptist Bible College, points out that some have mistakenly labeled Cramp as holding the Baptist Successionist view of Baptist History. He rather designates Cramp as holding the Spiritual Kinship theory, which I think a thorough reading of the book will affirm. The almost 500 page book is surprisingly well documented with footnotes, a feature not always available in older works. This recent edition also has a thorough index of names and subjects at the end. Cramp divides the book into eight “periods” beginning with the primitive, then the transition period, obscure (middle ages) period, revival, Reformation, troublous (English, the longest section), quiet (after the Restoration), and present (1800s) periods. I especially enjoyed the long section of English Baptist history from Bunyan to Spurgeon, and also the history of Roger Williams, the first great Baptist influence in America. In addition the book contains original sketches, or engravings as they were called, including Queen Elizabeth, Smithfield (place of English martyrs), St. Paul’s Cross, King James, John Milton, the Bedford City jail, Wesley, and Whitfield. In a further interesting section Cramp inveighs strongly about John Foxe (the well-known martyrologist) for his Church of England sympathies against the dissenters though he (Foxe) objected to the severities of the persecutions. “But good old John was still in the dark. He did not understand soul-freedom. According to him, Baptists had no right to hold and profess their opinions. They were ranked with those ‘fanatical sects’ which ‘are by no means to be countenanced in a commonwealth,’ but ought to be ‘suppressed by proper correction.’” (Those quotes from Foxe are attributed to Crosby’s History of the Baptists). Interesting.